May 3, 2011 By David Munkittrick & filed under Gluing and Clamping, Skill Building. Few pieces of furniture get more abuse than a chair. That’s because chairs have to solve two contradictory problems; they must be light enough to be mobile but strong enough to hold the shifting weight of its occupant. Light joints, big loads and constant movement add up to a lot of wear and tear on chair joints. Its no wonder chairs are the most common repair item brought into my shop. 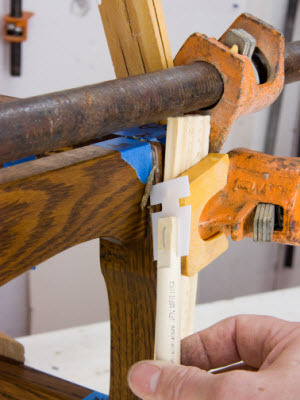 Chances are, if you are a woodworker, you’ve been asked to fix loose joints on a chair, too. This article will show you how to do it right. I cringe when I think of the first chair I repaired. I thought loose joints just needed a healthy dose of PVA glue and a little clamp pressure. The chair seemed good and strong when I was done but within a few months, the joints had come loose again. A little research and some lessons from a professional restorer taught me that my approach, though well intentioned, was completely wrong. 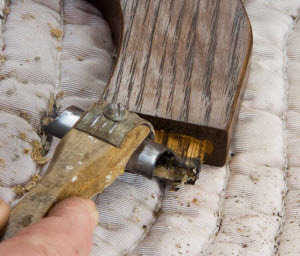 Most chairs built before 1950 were put together with hot hide glue. The beauty of hide glue is that it is completely reversible. That allows you to reactivate the glue with a little water making repairs simple. PVA glue just messes things up. Both PVA glue and hide glue work by soaking into the wood fiber. 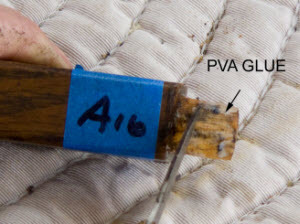 The problem with using PVA glue to fix hide glue joints assembled is that the cured hide glue acts as a sealer and keeps the new glue from properly penetrating the wood fibers. 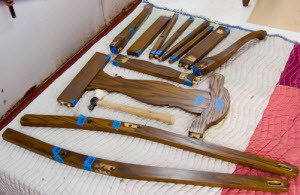 Yes, the water in the PVA glue will help reactivate the hide glue and possibly allow for some wood fiber saturation, but the joint will not have the strong glue bond it needs to withstand Uncle Henry shifting around in his chair at Thanksgiving. And worst of all, PVA glue is not reversible, making future repair work difficult. In this article I will concentrate on how to repair joints that are structurally sound, but loose. 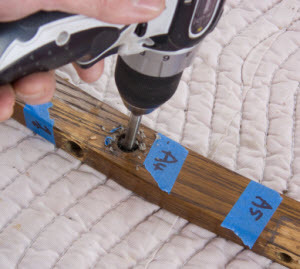 I will show you how to fix broken dowels, clean off the inevitable PVA glue from previous repair attempts plus some basic strategies I’ve learned over the years to keep you out of trouble and guarantee a successful repair. These are my standard go-to tools for chair repair work. My wife says it looks like a Civil War surgeon’s field kit. I choose to take that as a compliment. 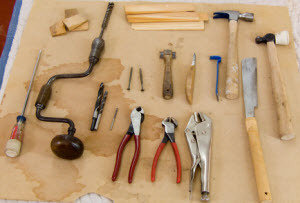 You’ll see all these tools employed throughout this repair procedure. I always cover my bench with a moving blanket to protect the furniture parts. First, mark the joints for easy re-assembly. Chairs have a lot of parts and weird angles. Putting the chair back together without a road map is a frustrating, time-consuming activity you’ll only do once. I use painter’s tape designed for delicate surfaces and mark the joints with letters. When it’s time for reassembly, all I have to do is match up the letters. Even the glue blocks get marked. Remove all the fasteners. A mini-pry bar is just the ticket for tight spots like this. 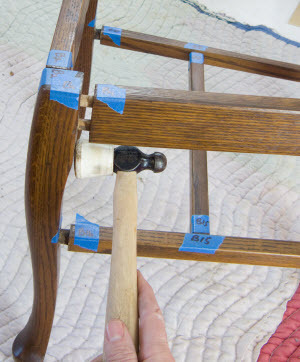 Knock the chair apart one section at a time with a rubber tipped mallet. 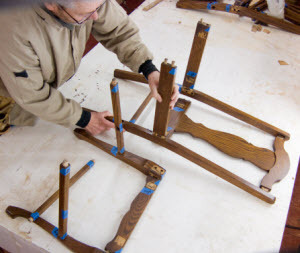 Chairs generally consist of three sections: the front leg assembly, the rear leg or back assembly plus the stretchers and seat rails that connect the two. The joints on this chair came apart easily. For the joint that doesn’t want to give up, you may need hot water. Tip: A rubber cane tip turns an ordinary hammer into a rubber mallet. 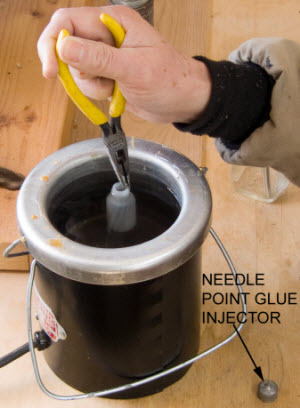 A needle point glue injector is the perfect tool for getting hot water into stubborn joints. Denatured alcohol works as well, but I prefer hot water because it does not evaporate as fast, has no odor and is less likely to affect the surrounding finish. I use my glue pot heater to warm the water to 140-degrees, before I fill the bottle. A hot plate with a double boiler works as well. Squirt some hot water into a stubborn joint. Even if the joint is tight, the water will seep in through capillary action. Be patient and let the water work. You don’t want to break the joint in order to get it apart. All the king’s horses and all the king’s men didn’t have painter’s tape and a Sharpie. Despite the previous repairs with yellow glue, this chair came apart easily. Unfortunately, the yellow glue I found in some of the joints meant more work was ahead before I could put Humpty-Dumpty together again. Note: The back slat joints were sound so those joints were not taken apart. A bit and brace works great to clean old glue from the mortise bottoms. You want to free up that space for glue overflow when you reassemble. 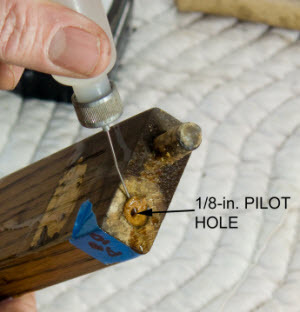 Be sure to soak the mortise with hot water first to soften the glue. If yellow glue has been used on the joint, switch to a hot vinegar solution to help soften the glue. I prefer the brace over a power drill because it gives me complete control without the risk of a bit catch enlarging the hole. 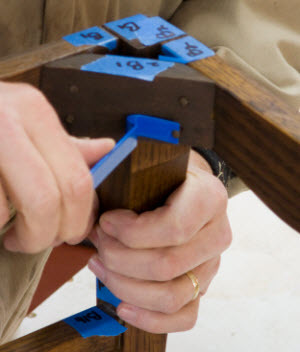 Select a bit that exactly matches the mortise diameter and use the mortise sides to guide the bit. 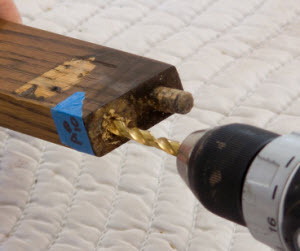 If the mortise sides are not clean enough to guide the bit, use a Forstner bit (see below). Tip: Old sock tops pad the hand clamp used to secure the chair leg for drilling. Use a Forstner bit if the mortise sides have chunks of glue and wood stuck to it. A Forstner bit has a flat bottom making it a prudent choice if the screw lead on an auger bit would penetrate the part before cleaning out the mortise bottom. 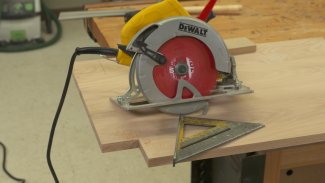 Cut off any broken dowels with a flush cut saw. Drill a pilot hole through the center of the broken dowel. Inject the joint with hot water using a needlepoint glue injector. Let the joint soak for an hour or so and keep it filled with hot water. Dowels that aren’t loose, like the one above the broken dowel, can be left alone. Thread a #10 screw into the pilot hole. 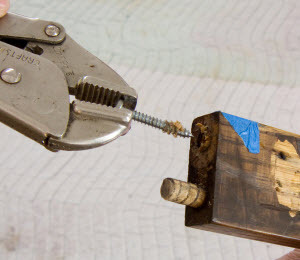 Grab the screw with a vise grip and give the part a whack with a rubber mallet. 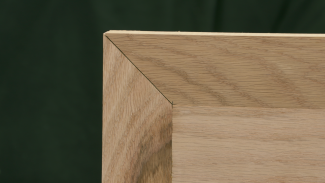 In cross grain situations like the one shown here, the dowel will often pop free. Some dowels just won’t give up their grip. When a dowel is set parallel to the grain as it is here, the joint is stronger than a cross-grain joint. Sometimes, the screw will strip out of the hole leaving the dowel behind. Rats! ” alt=”Chair Repair Done Right” width=”300″ height=”251″ class=”alignleft size-full wp-image-1690″ />Ream out the dowel with a twist bit. Choose a bit at least 1/16-in. smaller than the dowel to avoid damaging the mortise sides. Fill the hole with more hot water after the hole is drilled and let sit. 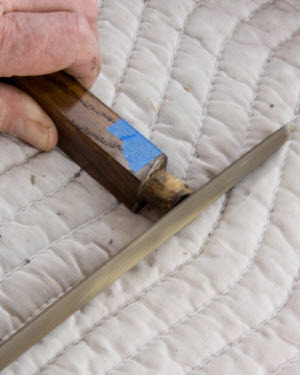 Dig out the remaining dowel parts from the top of the mortise with a narrow knife. Take care not to enlarge the hole. 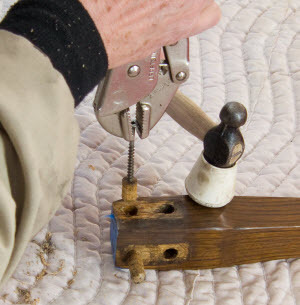 Use a twist bit equal to the dowel diameter to finish cleaning out the mortise. I use a vise grip to hold the bit and ream by hand. If you choose to use a power drill, run the bit backwards to avoid a catch that could enlarge the hole. Note: Square mortises are cleaned in much the same way as round ones. First, soak the mortise with hot water (use vinegar to soften PVA or yellow glue). Then shave the softened glue with a chisel. 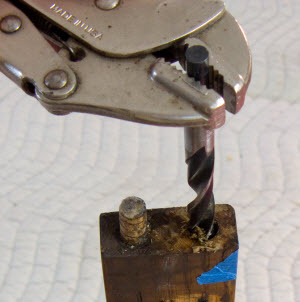 Use an undersized drill bit to get the dried glue out of the bottom of the mortise. Take care not to contact the mortise sides. Now that the mortises are clean and broken dowels removed, it’s time to turn our attention to the tenons. Dip the tenon in the hot water bath. Hold for a few seconds then remove to inspect. Scrape away any PVA glue that will show itself as a whitish residue. Hide glue will simply soften and turn tacky with the hot water. 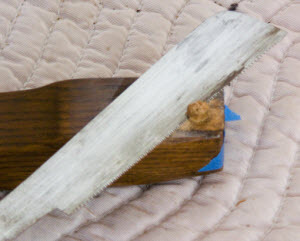 Typically, the PVA glue sits on top of the old hide glue and comes off easily. If the PVA glue is stuck fast, try switching to vinegar instead of water to soften the glue. Be careful not to scrape away the wood. 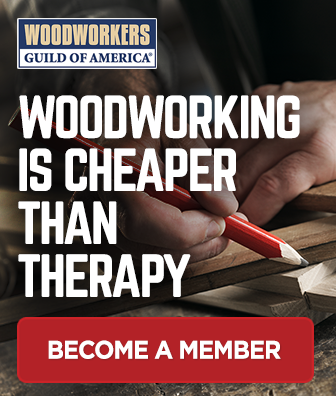 You don’t want to make the tenon smaller. A brass brush is handy for removing the smaller bits of glue. Scrape square tenons clean of PVA glue with a small paint scraper. File off any excess glue stuck to tenon ends. Dry fit the cleaned up and repaired chair. Don’t skip this step. It takes very little time and gives you a heads up on any problem areas you may have missed. Better now than in the middle of a glue up. (Remember, glue up rhymes with screw up.) Once assembled, practice setting clamps. 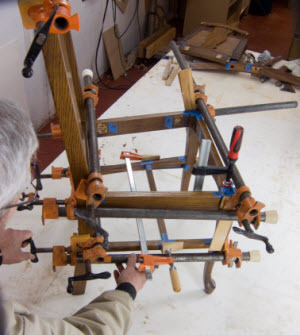 Chairs can be tricky to clamp with all the angles and shapes. A dress rehearsal is a good idea before tackling the real thing. You don’t want the glue to set while you struggle with clamping strategies. When reassembling with hide glue, weigh out the glue you need as per instructions on the jar. A kitchen scale works great for small quantities like this. A couple ounces worth of dry glue is plenty for a typical chair. Don’t skimp. 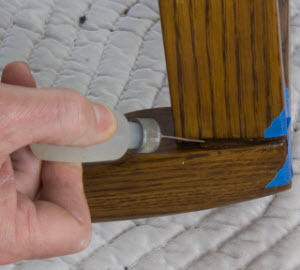 Even though leftover hot hide glue won’t keep, you don’t want to be caught short before your chair is assembled. Put the measured glue in a glass jar and add water. Let the mixture soak for an hour. 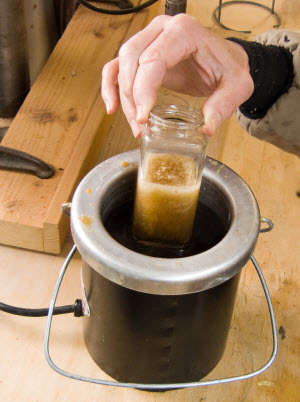 Put the cold glue mix in the glue pot. 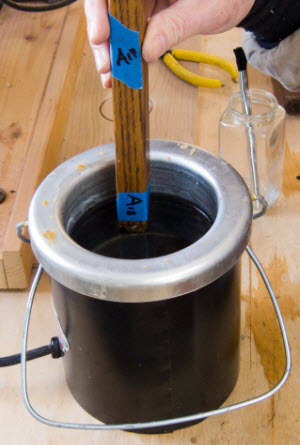 A commercial glue pot costs about $150 and is well worth the money. Essentially a double boiler, it keeps the glue at a constant 140-degrees. For small quantities, I fill the gluepot with water and let it come up to temperature, then set the glass jar in the water. Note: You can use a hot plate and your own double boiler. Use a liquid thermometer to find a setting that will keep the water at 140-degrees. Once the glue is hot, the pot can be removed from the heated base to take to your bench. 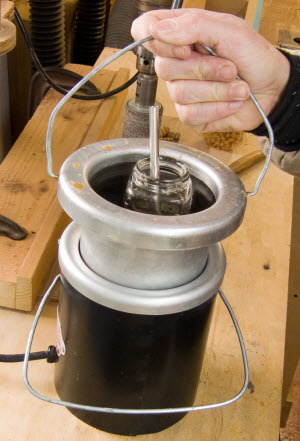 This allows you to take the glue to the project unfettered by an electrical cord. Return the pot to the base whenever there’s a break to keep the water heated. The glue will thicken as it sits in the pot. Add more water to keep the glue the consistency of honey. A disposable glue brush is a perfect applicator. 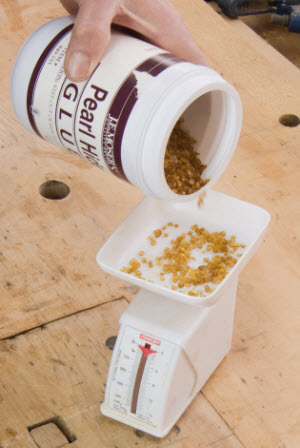 Hot hide glue has a fast tack set but a long open time. That means parts will stick together almost on contact, but can be repositioned later without affecting the bond strength. Assemble the chair in stages. Brush glue on the tenon and in the mortise then push the parts together by hand. Once you have one assembly done, such as the front leg assembly shown here, apply clamp pressure. Then, assemble the next section. Your goal is to glue the whole chair in one setting (or, in the case of a chair, sitting). It takes an array of clamps and shims to get the whole chair assembled. Clamp pads protect the finish. Shims help compensate for the odd angles and keep the clamps from slipping as pressure is applied. 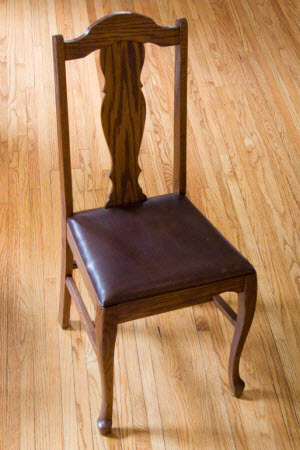 It’s best to assemble the whole chair upright on a flat surface to insure all four legs make contact. You don’t want to assemble a chair that rocks. Peel off glue squeeze-out. Remove the foam from a used disposable brush and you’ll find the perfect hide glue peeler. Catch the glue when it’s rubbery and soft. If you try this too soon, the glue will smear; too late and the glue will have too much set to come off easily. 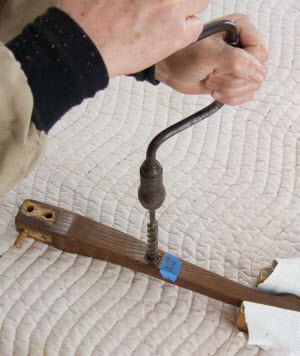 Wipe down the outside of the joints with a damp rag to remove any remaining glue residue. All fixed up and ready for another 100 years. Can you help?. In a previous repair, someone drilled out the hole in the chair leg/ mortise for a larger dowel. So, there is little strength left in the leg/ mortise. We have larger dowels and yet are concerned about the strength of the joint. 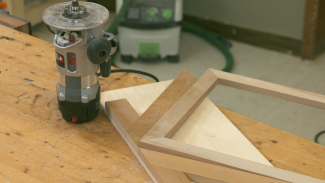 Would it be good to glue a large dowel in that hole, cut it off flush and then drill out a hole to fit a smaller dowel (which is what it was originally)? Or, continue with a larger dowel? Many thanks for any help you can offer. Now I know why my re-glued chairs keep falling apart. This is no easy job. First of all, thank you for this excellent article, it is fantastic, but I wanted to add a few notes from my BEGINNER experience. Glue up rhymes with screw up? Um… yeah. As I followed all the steps that line stayed in my mind. I had everything disassembled, labeled and cleaned of glue residue. It was the moment of truth. I looked at the chair lying there neatly arranged on the floor and took a deep breath… here we go. I did my dry fit first. I didn’t truly hammer everything together, I just sort of put it together to make sure I knew where the parts went… I thought that was the main point. BIG MISTAKE. I glued up my first pieces (using titebond liquid hide glue) and it was going pretty well, although I was making a HUGE MESS with the glue. Then came a problem piece. I COULD NOT get that sucker hammered in. I was banging on it with a mallet using all my strength. (as a female I unfortunately run into this problem a lot with my projects) I was really wishing I had waited till my husband was home. I hit the hell out of that thing and eventually just moved on, not sure what to do. The glue was going to set. I got the rest of it glued and hammered together, having the same problem in another spot. I was working on a thin foam pad and thought that might be part of the issue so I moved it to concrete. This helped… until the dowels broke off on my main problem spot. DANG IT. I was cussing up a storm. I had glue everywhere, on the bottom of my feet and all over my pants. I just kept going and began clamping. Once again I was really wishing I had a second person to help. I was using wood blocks to keep marks off the chair and it was a b!tch trying to adjust and hold the clamps along with the blocks. I finally got it and was one clamp short. Oops. Another mistake. This chair wasn’t a family heirloom or anything and it was a great learning experience, definitely more difficult than I anticipated. I’m not sure what I’m going to do about the broken dowels… I really don’t want to hammer the whole thing apart and start again. I probably should have just taken it all apart when that happened. I wanted to share this experience in hopes that it might help another novice out there thinking of tackling this project. Dry fit ALL THE WAY, carefully count every spot that needs clamping and have a helper available. I recently fixed three chairs that had loose legs as the center screw metal insert was loose in the hole (I ended up tossing the center screw apparatus). The chairs did not have any dowel or tenon joinery previously but I used pegged mortise tenon joinery and then glue blocks with liquid hyde glue from woodcraft (no need to mix it as comes in glue bottle) for the mortise tenon joinery and PC7 two part epoxy for the flat surfaces. It was a lot of work to make the pegged mortise tenon joinery but I feel this joint will not fail. I found a chair on a curb, it was ratty, but I she potential. I tore off some of the rotten upholstery to find a beautiful curved wooden arm. The other arm same. The ends of the arms have been cut off. Where would I look for arm tips to reattach? I want to repair a chair that was going to the dump. The left side of the chair is one piece from top to bottom with spindles in between the back support and the broken area is where the seat is attached to this one piece with a screw going in from outside into seat of chair has splintered, but fits back together. Please give me advice on what to use to repair. This is my first attempt and I’m 73 yrs. old. Hi Linda. Please send some pics of your project so that we can provide you with better guidance.3-4 pictures from different angles and zooms would be ideal. Great advice–wish I had found it sooner. Much of what you describe I had to learn the hard way. A problem I have not solved. Old chairs often have legs and other parts that are decoratively turned. There are square sections, round sections, egg shaped turnings, etc. some of these areas make weak points and the part snaps at the weak point. The question is how to repair. Most of the time the break is jagged. One can fit the pieces back together with glue and apply end-to-end pressure (very carefully or the resulting repair will not be straight). 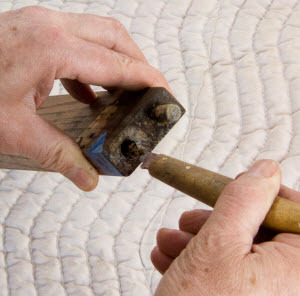 It would be much better to drill each piece at the EXACT center and strengthen the repair with a dowel. The question is how to find the center and then to drill perfectly coaxial holes in the two broken parts so the dowel makes a very straight repair. Advice? Hi Chas. In my experience with chair repair, I have found that it is better to recreate the broken part in situations like that, rather than attempt to repair a component that was not structurally sound to begin with. I make the part slightly beefier so that the weak link is not as likely to break. Hi Georges. These images have now been fixed. Let us know if you are still having problems. Very good read and good tips!! I restored an old Victorian dining room chair when I was 14 just for fun (that was 54 years ago) with very little knowledge and tools. The chair is still in one piece and stands in our spare bedroom. I restored a 125 year old round Victorian piano stool for friends a couple of years ago. It had been painted white by some individual in the distant past. Loose legs, broken cross pieces and a missing section where the one leg fitted, which I routed out of some Mahogany. Looked great when finished and they had a new seat upholstered. 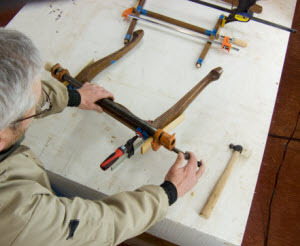 At some stage I will have to tackle my Morris chair which creaks and groans when I sit in it and will apply the techniques as described in the article. Tip: when repairing broken spindles/etc I wipe the outside finished areas with Johnson’s wax prior to glueing. This allows the glue to be easily removed from the finished surface without sanding or damaging the original finish. 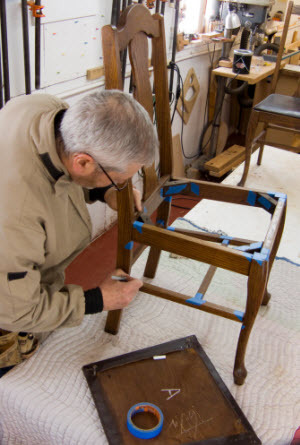 Can you recommend a professional restorer in Los Angeles that can fix my Limbert chairs (6) with this method? Rather than just jamming in glue, only to have it fail again a few months later? This is beyond my skill level!! I have recently moved to Riverside, CA from Oregon. We have 6 chairs that have been in the family for. 75+ years and they all need regluing. Your article have been very helpful and I am looking for someone in our area to help solve the squeaks. Would you suggest someone? Thanks for your help. Hi Millie. I don’t have a lot of experience with this, as we are primarily focused on building new projects rather than repair. I would suggest checking with a repair person for better guidance.